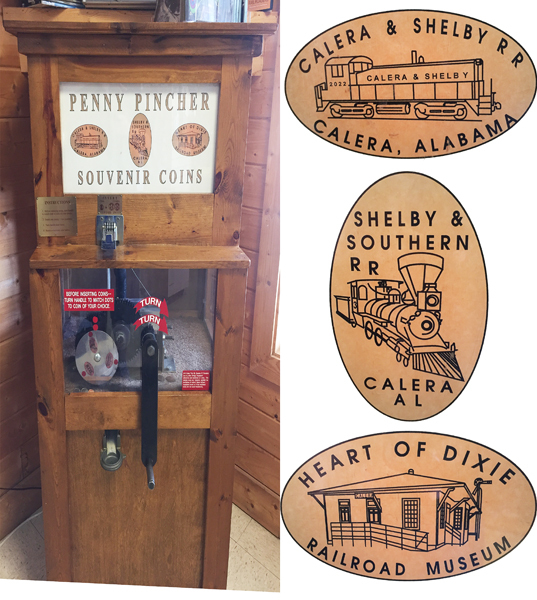 The Heart of Dixie Railroad Museum is the official state railroad museum of Alabama. Dedicated to the preservation, restoration, and operation of historically significant railway equipment, the museum is located on I-65 approximately 30 miles south of Birmingham. The museum features a wide range of locomotives, cars and other railroad equipment that dates from the 19th century to the 1950s and operates regularly scheduled excursions with museum equipment over the museum’s track. It also features two depots that are approximately 100 years old. Machine located inside gift shop beside cashier on the left by the toy train set for children to play on. 1) Calera & Shelby RR (on top ) Diesel Locomotive ((image)) (in center) Calera, Alabama (on bottom). 2) Shelby & Southern RR (on top) angered Steam Locomotive ((image)) (center) Calera AL (bottom). 3) Heart of Dixie (on top) railroad station ((image)) (center) Railroad Museum (bottom). thegillion added Heart of Dixie Railroad Museum to system.